Walking with Jesus: Day 19: Acts 7:23-43 & Prov. 9:1-12 - How is Moses a Foreshadowing of Jesus? Day 19: Acts 7:23-43 & Prov. 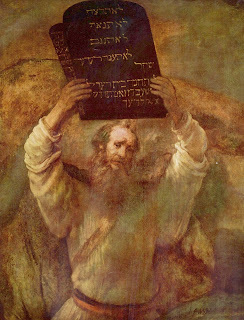 9:1-12 - How is Moses a Foreshadowing of Jesus? How is Moses a Foreshadowing of Jesus? In the Gospels, Jesus criticized the Pharisees and religious leaders in Israel for their failure to recognize Him as their Messiah. He said to them. "You search the Scriptures because you think that in them you have eternal life; and it is they that bear witness about me." (John 5:39) Now, in Acts 7, Stephen is on trial before the same Jewish council that condemned his Lord, and he offers the same testimony: The Scriptures God gave to Israel testify about Jesus. As Stephen continues his Bible history lesson for the Sanhedrin, he spends considerable time focusing on Moses, drawing out aspects of Moses' life that foreshadow Jesus. Moses was the greatest deliverer of God's people until the coming of Jesus and in the details of his life and the deliverance he brought, we can see hints of Jesus, as God was preparing His people for the true and final Deliverer. Prior to Moses, the greatest deliverer of the people of God had been Joseph, and they had sold him into slavery. It seems clear that God's people have a history of rejecting their saviors. Stephen wanted the Jewish leaders to see that their rejection of Jesus did mean that Jesus was not the Messiah. The Jewish leadership wanted God's people to think that Jesus could not possibly be the Messiah, because they had tried and condemned Him. But God's people had violently rejected Joseph and had rejected Moses multiple times, too. In fact, one of the key verses that the New Testament church came to understand as explaining Jesus was Psalm 118:22: "The stone that the builders rejected has become the cornerstone." Jesus Himself quoted this verse in the Gospels and then Peter quoted it in his trial before the Sanhedrin in Acts 4 and in his first letter. We can often be tempted to think that the world's rejection of Jesus and His Gospel means that we're doing something wrong, that we need to change. But the truth is that Jesus told us to expect rejection from the world, which is exactly what He experienced, too. But God works through the world's rejection. He did it in the lives of Joseph and Moses. He did it on the cross through Jesus. He is doing it through His church around the world, too. Heavenly Father, Thank You for loving us and for giving us life in Your Son. Thank You that the stone that the builders rejected has indeed become the cornerstone, the chief stone of the new and living Temple. Thank You that You have made us living stones in that Temple and that You are shaping us and making us into a house for Your glory. Let us trust You and follow You always. In Jesus' name, Amen. Oh Lord, Your house is built by wisdom. Your table is set with the feast of knowledge and understanding. We are simple and needy, and so we come to You. Satisfy us with Your truth and fill us with the good things of Your house. offering empty things that can never satisfy. found in Your Son, Jesus Christ, the perfect wisdom. Your house is Your church, build on the foundation of Christ. You call Your people and make us Your dwelling place. that we may dwell in You and You in us forever. and satisfy us with the Bread of Life. and so find true wisdom, which comes from You.